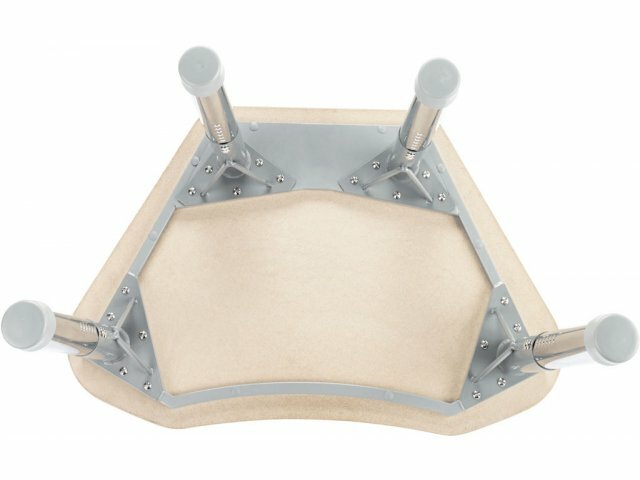 Petal Collaborative Student Desk- Hard Plastic, Standing Ht. Laminate top shown, with optional bookbox and casters. 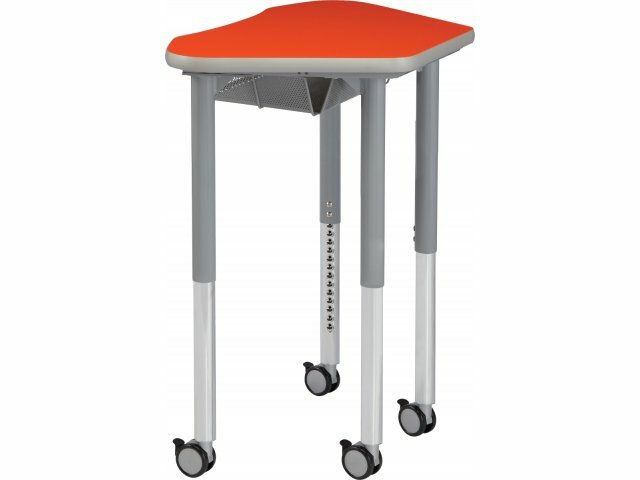 Standing height collaborative desks let your students work together at a height that is comfortable for them. 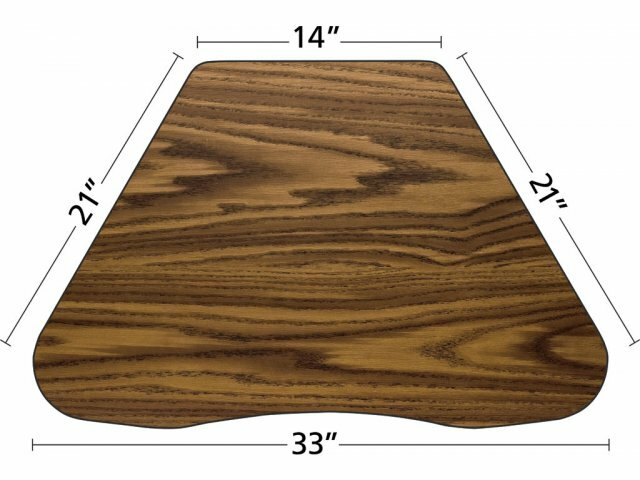 Inspire creative thinking in your classroom with Academia’s smart Petal desk. Whether your lesson-plan calls for independent student learning or collaborative group work, the versatile Petal Desk fits the bill. 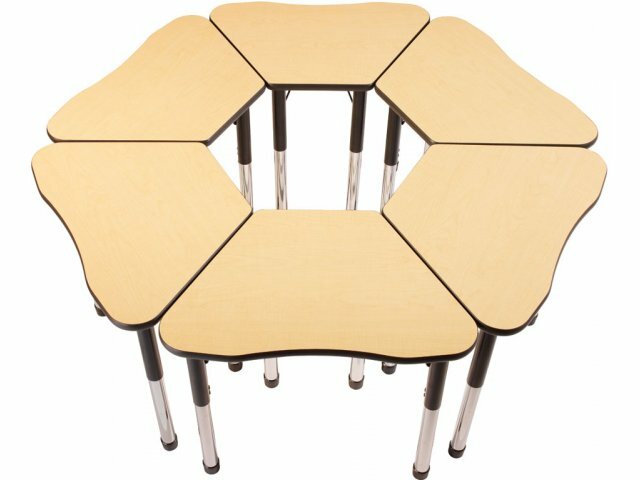 The Petal Desk can stand alone, or six Petal Desks can be adjoined to form a hexagonal flower-shape cluster. 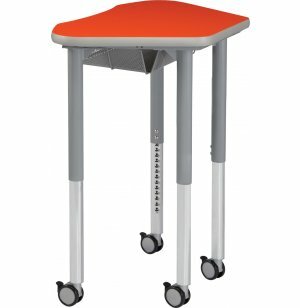 Height-adjustable legs accommodate students of all ages; choose from toddler height range, standing height range, or regular height range. The work surface is roomy enough for workbooks and elbows to spread out. Hercules legs ensure years of use. Optional bookbox in perforated steel can be attached easily. Made from resin and wood flour, molded at a very high temperature and pressure. Hard plastic is smooth, attractive and incredibly durable. Virtually Indestructible: The hard plastic desktop is stain and scratch proof, and can even take tough abuse like pen jabs and pokes from sharp objects. 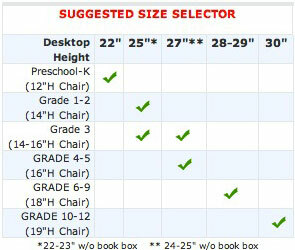 Adaptable: Desks are height adjustable in 1-in. increments from 26-42". Extremely Durable: Legs are mounted to the metal frame, not directly to the desktop, so they won't get loose when desk is dragged from place to place. Solid Build: Fully unitized (self-standing) frame makes these desks extra sturdy. 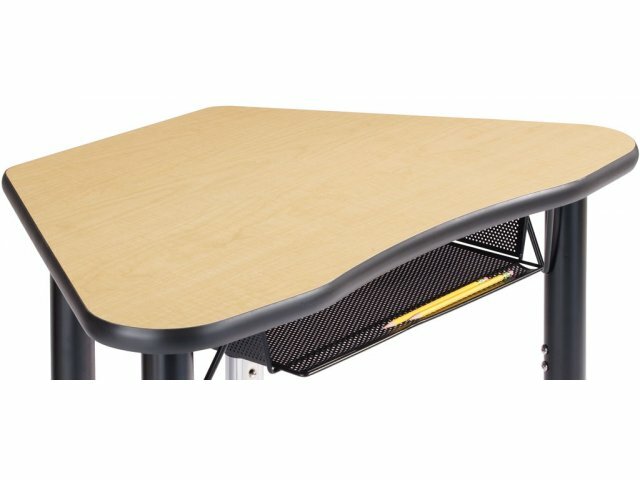 Tough Connections: All metal-to-metal connections mean that this desk will withstand even the toughest student use and abuse. Comfortable: Molded edge-banding provides a smooth desktop finish for students to sit up against. Spacious Worktop: Roomy desktop, 33 x 14 x 21 in., gives ample space for school materials and learning. Optional bookbox offers an additional place to put supplies right beneath the work area. Versatile: Creative design can suit students learning independently or in collaborative clusters. Attractive: As a stand-alone desk or grouped into a hexagonal flower shape, this desk is eye-catching and attractive. Extra Strength: With leg uppers of 18-gauge, 2-1/8 in. steel, leg inserts of 16-gauge, 2 in. steel, and a hairpin brace for extra stability, this desk will be standing strong through generations of graduations. Stable: Leg glides feature a 2" footprint for exceptional stability.